We have gone through many civilizations and centuries, but no period like one often called the "Dark Ages." Were the Dark Ages really "dark"? Let us look to the Byzantine and Medieval Europe to find out! Have a contextual understanding of the early Medieval and Byzantine art. Gain an understanding of various art historical themes present within these cultures. Following the death of Constantine and reconnection of the entire Roman Empire, the empire soon slipped back into strife and was split once again between east and west by Theodosius in the fifth century, when the capitol was moved to Ravenna. The Roman empire to the east was unified by similar religious beliefs and defence against common enemies like the Ottoman Turks. The eastern empire is known as Byzantium, which referred back to the original name of the area Constantine renamed Constantinople. Though the Roman Empire was in collapse, these new emperors did not call themselves "Byzantines," but instead insisted that they were Roman. They kept with earlier Roman traditions even though they spoke Greek, not Latin. This empire lasted nearly 1,000 years as the rest of Europe shifted as the result of conquests, even as it remained unified under the Roman Catholic church. The western European empires were in constant flux. Early in the fifth century, warrior lords held claim over most of Europe. Militaristic societies like the Celts, Vikings, and others had individual, defined cultural styles. These cultures quickly formed into empires of their own, including the Hiberno-Saxons of Britain and Ireland and the Carolingian Empire, both of which were unified under the Roman Catholic church, led by the Pope. Medieval and Byzantine Eras: Khan Academy introduction to the era. Great Britain and Ireland; Central Europe (including Germany); France; Iberian Peninsula; and the Italian Peninsula Helibrunn Timeline of Art History. Each region is a separate link to provide a timeline of events and set the context for the various regions of Europe. In this section, we will discuss more of the specific stylistic elements found in the artifacts from the various periods of the early Christian and Byzantine art. Understanding the themes within Christian mythology is critical in fully understanding the symbolism contained in any of these images. Byzantine art is separated into three chronological categories: early, middle, and late. Many Byzantine-era artifacts were destroyed during several iconoclastic attacks, the artifacts that remain demonstrate the power of religious symbolism through mosaics, manuscripts, and innovations in architectural production. The "golden age" of Byzantine art is aptly named since images were dominated by gold and other rich media. The early years were shaped by artistic production under Justinian, including Hagia Sophia and other monuments stretching as far as Ravenna. The style shares some features of late Roman imagery and early Christian themes and stylization. Justinian's power was demonstrated throughout his reign, including the monumental Hagia Sophia, now a secular structure after being both a church and a mosque. The sumputous artistic imagery of this period connects to a desire to express the power of the early empireand to use rich materials and their wealth to show their dedication toward the Christian God. Monuments like San Vitale in Ravenna connect back to this concept: even though Justinian and the Empress Theodora never visited the town, the inclusion of their life-size mosaic portraits symbolically links the Byzantine capital to these rulers. Saint Michael the Archangel (early 6th century): This ivory demonstrates evidence of the persistence of Classical art. Saint Michael the Archangel is the patron saint of Hagia Sophia, the jewel of the churches created during Justinian's reign as he spread the power of the Christian religion. It is inscribed, “receive these gifts,” a dedication to the sacrifices made in the artistic creation and the wealth represented in the ivory. The angelic form is modelled after the winged victory of classical art, a tradition that persists throughout Christian imagery for angelic forms. He also seems to float within an architectural space representing the kingdom of heaven. Hagia Sophia (532-537): This church was designed by mathematicians and physicists rather than architects; its monumental proportions required feats of engineering to blend symbolic meaning of the structure with the scale. The nave is enclosed under a massive dome that measures 270 ft by 240 ft, making it a rectangular space instead of the square that the dome suggests. The dome itself is 108 ft in diameter and 180 ft above the ground. And had to be rebuilt a few times since its original completion. The exterior has changed much since its rededications. Minarets were added when it was converted to a mosque and it is now a secular building used as a museum. The exterior is more plain and free of decoration in the Byzantine manner. The interior is truly magnificent. Light floods in through the many windows surrounding the domes, so the dome seems to rest on light rather than the structure itself. “Light comes from the Good and… Light is the visual image of God;” this natural light often acts symbolically within the architecture of churches. Gold finishes allow the light to bounce around the space in a regal, spiritual way. Some will call the Middle Ages the "Dark Ages," though the presence of light within their architectural constructions debunks that association. This was made possible through advances in engineering. Pendentives are the areas that transition from the shape of a square to a circle; squinches are the areas that transition from a square to an octagon. Pendentives allow for the transfer of weight from the dome to the 4 piers beneath. This made the dome possible and led to what we (logically) call a domed basilica, which means that a hemispherical dome is placed on a longitudinally oriented building rather than a central (totally symmetrical) plan. The building looks more like a central plan from the exterior due to the buttresses needed to support the weight of the dome as transfers to the piers. The basilica church type also veers from the Roman use of concrete by emphasizing brick construction. Ravenna: During this period, Ravenna became something like an Italian extension of Constantinople. The artwork shows the transition from early Christian to Byzantine art. San Vitale (526-547): San Vitale was built using a sum of 26,000 gold pieces (350 pounds of gold!). It is unlike any other church in Italy. It is composed of a central plan of concentric octagons within a traditional plain exterior. The choir area precedes the apse instead of coming after the altar. It also has an odd angle for the narthex, which coincided with the original street. The mosaics are considered some of the crowning achievements of Byzantine art. They represent the holy ratification of Justinian’s right to rule. Christ holds a scroll and sits on the orb of the world at the time of his Second Coming, representing the power of Christianity over the world. Christ also extends a wreath to the martyr Saint Vitalis (for whom the church is dedicated) and is presented the church through the bishop Ecclesius, who offered the dedication. Justinian and Maximianus are depicted on the choir wall to the left. Justinian is flanked by Bishop Maximianus who was responsible for the completion of the church. Halos visually unify Justinian with Christ. He is also accompanied by a dozen attendants, furthering the symbolic connection between his political and religious roles. The leader of each group is symbolized by the overlapping feet. Justinian is shown in procession with the Eucharist, which alludes to the rituals that would take place long after his death, much like votive sculpture seen in earlier cultures. The mosaics were also guided by a different aesthetic than previous cultures; here, the figures exist in a symbolic heavenly realm and there is less emphasis on naturalism. Empress Theodora accompanies her husband Justinian from her place on the opposite wall of the choir. Theodora holds a chalice for the wine to pair with Justinian's Eucharistic bread. She seems redy to follow the other procession, possibly indicating the order in which things were done at the time. Despite all this focus on the rule of Justinian and Theodora, neither Justinian nor Theodora ever visited Ravenna. Their inclusion in the program shows how influential they were. Sant' Apollinare in Classe, Ravenna: This apse mosaic demonstrates the patron saint of the region, Apollinare, who was martyred in the area. He is shown as a shephard, a parallel to early symbols of Christ. Twelve sheep represent the twelve apostles. We begin to see the stylization and the narrative symbolism used in these early Christian images. The devout and wealthy patrons of the arts commissioned illuminated manuscripts and Icons for their private worship. Few survive due to the Iconoclasm which soon follows this early Byzantine period. The main medium was gold and encaustic on wood. Encaustic was the method of painting with colored wax--a practice borrowed from Egyptian panel painting traditions. Saints often intervene on the worshipper's behalf in prayer. They are shown frontally and we begin to see a standardisation of the imagined physical images of Christ, Mary, and the various saints. They are often shown with solemn expressions as they stand in shallow shallow spaces, and their gestures become standardized as well. Basilica of San Marco: This Greek cross designed church encapsulates the middle Byzantine style and also the wealth of the Venetians. It is decorated both inside and out. 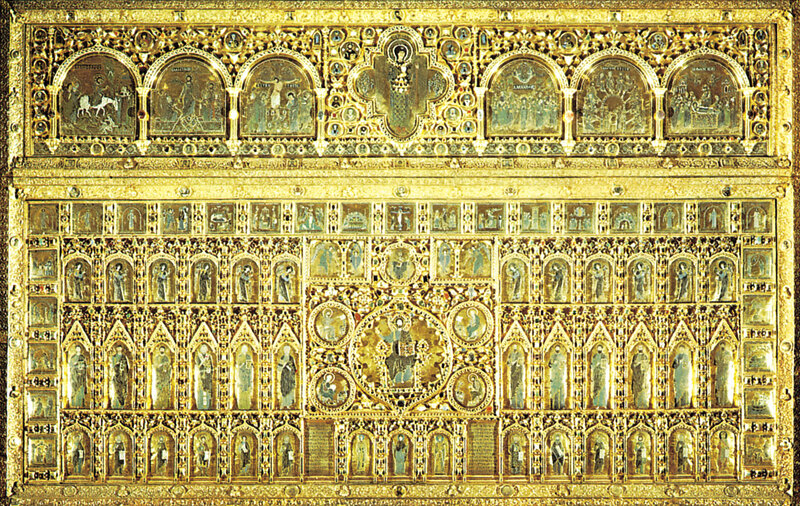 To further communicate the wealth of the Venetian nation, the Pala d'Oro (pictured below) resides as the altar screen, and it is fully guilded with gold and precious gems. The Paris Psalter: This era also demonstrates the continuation of manuscript illumination. Bibles and other texts had to be copied over by hand and often include illustrations to aid the text. The illustrations in this text further demonstrate the influence of Greco-Roman imagery in the depictions of the Psalms of David. The late Byzantine era is a time of contention as Constantinople was retaken by Michael VIII and held until the fall to the Ottoman Turks in 1453. During this time, there was a revival of mural and icon painting, including a move toward fresco as a preferred medium of mural production over the previous mosaic production. For more images of the Byzantine era, browse the Heilbrunn Timeline of Art History for a list of thematic essays and other artworks from the Metropolitan Museum of Art. The Medieval Era in Europe is broken into three main times: the time of the Warrior Lords, the Hiberno-Saxon and Carolingian empires, and the Ottonian Empire. The art of each empire blends regional aesthetic influences with Christian symbolism. During times of peace, we find growth of basilica church architecture, but many of the works we study from this period are smaller paintings, manuscripts, and portable works of art. The artwork of the warrior lords in the early fifth century Europe was shaped by the direct connection between regional styles and increased influence of Christianity. Smarthistory and Rebecca Mir examine these influences while looking at the artistry of fibulae throughout these times. Further examples of Anglo-Saxon artifacts can be found in a ship burial from 700, housed at the British Museum. Christian monasteries began establishing themselves throughout Europe. One of their main tasks was to reproduce the Bible and other religious texts that could aid the spread of the religion. The art of the manuscript illumination becomes the main type of artistic artifact from this era. Each manuscript further demonstrates the connections of regional style to new Christian symbolism. For more information on manuscript illumination, please refer to "Medieval Manuscripts" by Nancy Ross and "The Art of the Book in the Middle Ages" by the Heilbrunn Timeline of Art History. For a more specific text examples, there is the Book of Durrow, Lindisfarne Gospels, and the Book of Kells. Introduction to Carolingian Art: Heilbrunn Timeline of Art History. For a list of artifacts from the collection go here. Under relatively secure borders, church architecture began to become more immense. Churches built during this era and in this region established the conventions for church architecture for years to come, especially with the basilica format. Roofs were raised higher to allow for cloister windows that illuminated the space, and side aisles are added to allow for chapels and movement around the nave, which all led to the altar, choir, and apse. Manuscript illumination persists and architecture and architectural decoration becomes more important. A good example of this church design can be seen in St. Michael's Church in Hildesheim. Also, this church's doors describe the move toward naturalism and dimension in the depiction of the human form.